one-stop destination to get your startup business promoted successfully. Promote your Ebbok, event, product and anything with crowdfunding. Guestcrew ReviewEvery new small business need a good platform to promote and expose their product, service or anything they have to sell and earn. Facebook and Twitter being the biggest social media channel, have the potential to make any business successful. Social media is changing in 2015. It is becoming more integrated and more personal at the same time. This trend started in 2014, but this year it is going to snowball. How you use your social accounts is definitely going to change this year. You don’t have to adopt every new idea, but all these trends are ones you need to understand. To grow an audience on your own blog, you need to capture that audience from places that are already active. Platforms like Linkedin have 364 Million registered users! Don’t you want to get a slice of that? The easiest way is to start maintaining an active blog on linkedin and several other such places. Your primary goal is to have the best content possible on your own blog and on top of that, maintain several different blogs on your other online assets. Blogging is fun. It is a way to connect and network with people and build a strong online presence. When someone consistently blogs over a period of time they build an audience, social media presence, email list, on-site followers, comments, social shares – in short, via. blogging a blogger builds up his entire online business. This is why business blogging is so important for any online brand. But it needs to be done in a proper way otherwise the entire process is going to bring no benefit. This year – 2015, I have completed 10 years of blogging and here are the top lessons I have learnt so far. 1) Blogging is not Rocket Science – It is about doing the right things over a period of time – in a consistent and disciplined sort of a way. This includes everything from posting on a schedule, replying to comments, commenting on other blogs, sharing your own and other’s content on the social media. This is known as the Crux of Blogging as Herleena explains in her blog post. 2) Commenting – This is one of the best tools from the blogging arsenal. If commenting is done properly and consistently – over time it will build relationship with other bloggers, increase average comments per post, increase social shares, boost email list, generate backlinks both directly via. comments and more importantly from valuable organic mentions due to improved visibility. Kevin Duncan explains more about Blog Commenting on Jon Morrow’s blog. 3) Posting Schedule – For a professional blogger trying to build an audience of hungry readers expecting to consume the next piece of content – consistency is the key. That is how your readers start to expect when you are going to post your next blog post which ultimately makes them your loyal readers and they convert into a subscriber. Judy Dunn explains this further on her Guest Post on Carol Tice’s blog. 5) Formatting the Blog Post – The main purpose of a blog post is to get read – to get consumed. If your formatting is driving your readers away then you are surely doing something wrong. Writing long paragraphs is a mistake that we get taught in school and it becomes part of our habit. One of the very first things that I learnt from my mentor Jon Morrow was to write short paragraphs. He told me that the primary role of the first sentence of a blog post is to make sure that the reader reads the 2nd sentence and so on. We really need to make the first few sentences of a blog post “Pop” – real short and catchy! Sue Anne explains post formatting and layout further on her blog post. 6) Email list – One of the worst mistakes that people make early on in their blogging careers is that they don’t maintain an email list. Your email list is your most important asset and feedburner doesn’t count. Am still using mailchimp but have stopped using aweber sometime back. However, changing and chopping email services aren’t an easy work – it is best to do your own research and choose an email service that suite you best. 8) Building your Blogging Brand – Blogging is like any other business that requires branding to rise above the rest. This is much like personal branding where people will connect you with your blog and remember and value both as one and the same thing. However, branding does not mean distancing yourself from your readers; rather it is about making the connection stronger. Donna Merrill suggests using videos and images to build this connection further. 9) Keeping the Focus – There’s way too many things to do online and there is no reason why every single one of them can’t be done. But the problem is that none of them can be done at one time – you have to choose. This is known as the shiny object syndrome as explained further by Zac Johnson. If you are facing this, don’t worry you aren’t alone. My only suggestion is to keep your focus and always remember that you can only do one thing at a time – properly. I have tried to do too many things at the same time, it did not worked and it will never do. 10) Connect with Influencers – From my personal experience, influencers notice other influencers quickly. The difficult option here is to become an influencer yourself – while that is absolutely recommended, it just isn’t realistic. Atleast not right now. So, let’s focus on the easier methods here. 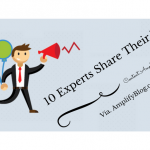 Do a Guest Post on a popular blog and request other influencers to share the post. Most of the time, you don’t even have to ask – for example my copyblogger guest post was re-tweeted by SearchEngineJournal without even a single poke. 11) Confront your blogging weaknesses – and beat them before they take over. There are plenty of things that hold you down when you try to grow an active and engaging blog. I remember when I wasn’t well – got jaundice which took over 2 months to heal properly – I lost the activity on one of my niche blogs that I had worked really hard on. The only thing to do at a time like that is to stop worrying about other blogs in the niche that doing better than you are, or your lack of traffic, comments and social shares – put the focus back on and start working hard and make sure your blog is returned to its former glory again. 12) Social Media Basics – It is important to follow the basics of social media even if you have only just started out. For example, say you have 2000 followers on twitter. Twitter is a platform that has a lot of social noise and very few true followers. The reason I say this is, out of the 2k followers you might have, most will just either mute your updates or they just don’t care about what everyone is saying. You can look at your own twitter feed and see how many updates are posted in a few minutes time – do you read any of that? So, the moment you posted 10 updates on twitter one after the other – you flooded everyone’s twitter timeline. Since most of your followers either don’t care or have muted you already – you only found out that you lost 20 followers. No big deal? But those were the only 20 people who were reading what you had to share! Bottom line is – respect your followers and treat them well. 13) Write, Write and Write – Have you ever tried to make a mental note of writing more content – after all that is the best way to develop your writing skills. As bloggers we already write a lot, which includes blog posts, comments, guest posts, blogging on web 2.0 domains, building up newsletters, ebooks, courses, freelance writing etc. However, we write all of it over time, not in a single day? Ever wondered about writing 10k words in a single day, every day! 14) Promote your posts – Promoting your blog post is as important as writing them. Get active on sites like JustRetweet, ViralContentBuzz, GuestCrew – amplify your blog posts using services like OutBrian. Share your content on the social media and B-list social sites like kingged, blogengage, blokube, dosplash, BizSugar, AmplifyBlog etc. There is a reason why B-lists are the best places to network and connect. Have you ever tried commenting on Mashable, Engadget, WallStreetJournal? You can’t connect with them – they are too big to notice. Similarly, B-list social sites are where small business owners’ hangout – they are the best places to connect. 15) Connect with New Bloggers – As a blogger it is important to make sure that every day counts. While it is important that we create fresh content every day, promote our existing content on the social media, reach out – link to and mention influencers every single day, similarly it is also important to keep building new connections every day. 16) Make a Content Strategy – As a blogger we do love traffic even if it is not targeted. I remember back in the old days when I got over 50k+ traffic from a Digg front page submission – most of the traffic did not convert to anything, on top of that the server crashed and my site went off line – but I still loved it. I guess that is how things are with bloggers – they just love traffic, stats and stuff. But at the same time you do need targeted traffic that converts on your landing page resulting in subscribers, sales etc. After all you do need results and the bills have to be paid. It is important that you focus on the right type of content that your business needs. Of course no one knows anything about blogging when they start after all they don’t teach blogging in school or collages, but they should? The bottom line is, learn quickly, expand and grow! Make every day count and build a huge blogging audience. If you are a small business owner and want increased exposure on Facebook, then read on. This post will walk you through ten Facebook marketing strategies that will multiply and maximize your business presence on the platform. So how do you get more people to open your emails and click through to your content? The answer: you have to use the right words. Because certain words in the English language are dramatically more powerful than others if you want to persuade people to take action – like clicking a link to your latest post. Let’s reveal exactly what they are.